Hey Striders! 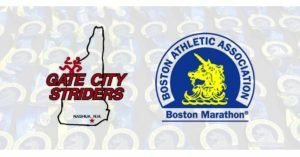 We are planning on having a Gate City tent at the Boston Marathon again this year. I’ve created an event for you to join if you’re interested in being there for some of the day. We’d really like a group to be there to help cheer runners, hand out snacks and see to the runners needs, and to represent Gate City. We’ll need help setting up, taking down, and transporting items too, so please join! Plan on Commonwealth Ave shutting down by 8am, so be there early or plan on using the side streets to get there. I put in the ROUGH address of where we’ll be set up for you to GPS. The crew normally sees the GCS Marathon bus off and then heads in – we’ll most likely depart from the 99 at 6:30 this year if you’d like to caravan. Plan on dressing for the weather, bringing lunch/food/drink as well as extra clothing, sunblock, etc. Also bring work gloves if you want them for setting up/tearing down.